Packing Way: 1 pcs/opp,or according to your requirment. Specifications can be supplied 1. Rendering material: Twill/ cotton/ jean/ felt fabric/ terylene? 2. Craft: 100% embroidered 70%embroidered 50% embroidered 25% embroidered 3. Border: Merrow / covered/hot cut/ 4. Backing: Iron on/sew on/plastic backing/ 5. Thread: Polyester thread/gold thread/silver thread/rayon/ 6. Color: Any color you can find on pantone 7. Payment: 30% before sample, the rest before shipment 8. Size: shapes and sizes according to your requirement. 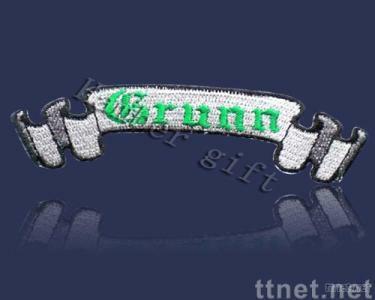 Our embroidered patches feature State-of-the-art, computerized, machine-quality construction The finest fade-resistant, polyester color threads A high thread count, fine-twill backing for long-lasting quality If you are interested in our product, Embroidery size, logo and quantity will be required. Thank you!